There is a new alternative to the foldable phone already. 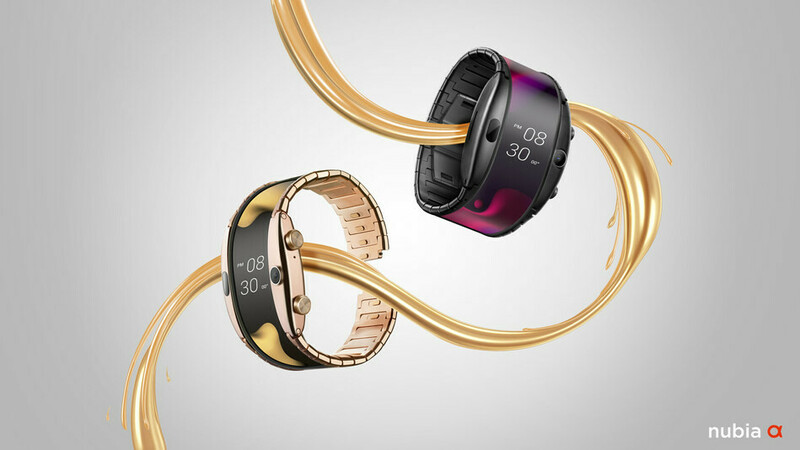 Nubia has unveiled the Alpha, a device with a screen that curves along a wide watch-like form factor. This display is 4 inches long, and operates using the Snapdragon 2100 wearables processor. Flexible displays can make up devices besides foldable phones. That is the general idea behind the Nubia Alpha. This device is being marketed as a phone, even though its screen wraps around a form-factor meant to be worn like a watch. In reality, this product is more like a large bangle, although it does have segmented sections like a typical metal band. They form a flexible backing for the screen, which runs all along the front of the device in a wide strip. The Nubia Alpha has a 4-inch display, which brings its size up to 230% greater compared to the average wearable. It is poiwered by the Snapdragon 2100 and 1GB RAM, which is a slight shame as the next-generation Wear 3100 is also available now. The Alpha also packs 8GB storage and a 5MP camera into its new and unusual design. This device will come in a variant that connects via Bluetooth and Wifi. Alternatively. Nubia says that there will also be a version with additional 4G eSIM support for standalone operation. A user may make the most of the Alpha's curving screen through a custom-designed Nubia UI. The Nubia Alpha has been launched at MWC today (February 27, 2019). Its Bluetooth-only variant will cost €449 (about US$510) at launch, whereas the eSIM version will cost €549 (~$624) - or €649 (~$738) for an 18-carat gold-plated SKU. This variant will be released in China initially in the 2nd quarter of 2019, in Europe in the next quarter thereafter and in the US the quarter after that. The non-eSIM version, on the other hand, will be released in April 2019 worldwide. It will be interesting to see if users are flexible enough to give this take on foldable tech a go.